Vagabonds from space visit the inner solar system! There are a few comets of interest that will be visible at the end of 2016 and the beginning of 2017. C/2016 U1 (NEOWISE) may become as bright as magnitude ~6.5 after perihelion in mid-January. 45P/Honda-Mrkos-Pajdusakovareaches perihelion at year end it will be at -19°13' declination. This comet is predicted to reach magnitude ~7 in early January. In early February the comet will pass less than 0.1 AU of the earth. It has a period that is currently about 5.3 years and made a nice appearence in 2011. C/2015 V2 (Johnson) will reach perihelion in mid June 2017. It may reach magnitude ~7 in early June and may make a nice binocular object. The Minor Planet Center also provides ephemrides that can be imported into your planetarium programs and telescope pointing programs. This includes Astra's favorite open source planetarium program Stellarium. Recent Comet Brightness Estimates - reported to the Minor Planet Center at Harvard. Check here to see what comet observations have been made and submitted to the Center. Magnitude estimates are made by the astronomers and are subjective unless otherwise stated. Images of the original artwork by Lauri Kunkel! ! ! Links to Great Comet Stuff! Make A Comet Ephemeris for your location! Meteor Showers Online - Meteors showers are associated with comets. Comet Missions and Exploration from Space! At last, an exciting comet that wasn't overbilled in the media. This comet was the fifth comet discovered by comet hunter Terry Lovejoy. Using CCD camera images taken with a Celestron C-8 telescope, Lovejoy found this comet from Queensland, Australia on August 17, 2014. A long period comet, the perihelion date for Comet Lovejoy is January 30, 2015. Closest approach to Earth will come on January 7 when it will be 43.6 million miles or 70.2 million km away from us. This may well be the time that is as bright as it appears from Earth. If it reaches the expected magnitude of 4.6, it will be well within the limits for observing with the unaided eye. 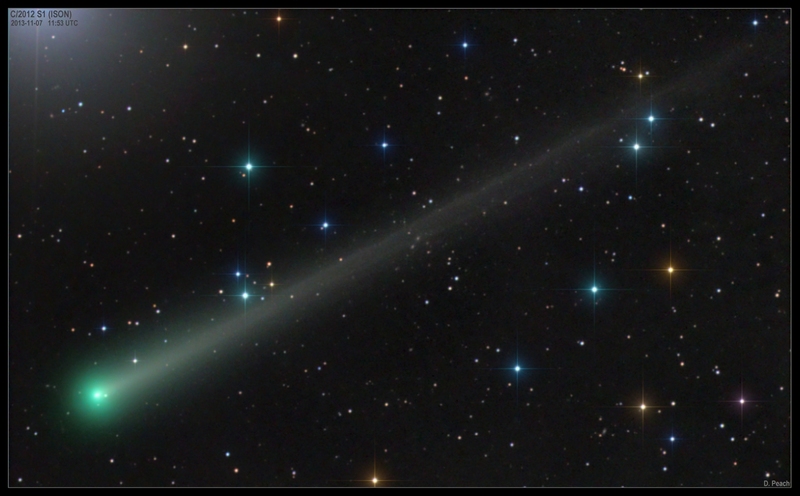 The image of C/2014 Q2, Comet Lovejoy was taken by Alan Dyer. Clicking on the image will take you to his site on Flickr. Used by permission, this image is ©2014 Alan Dyer. Check out Alan's site, Amazing Sky for more on astrophotography. As the year opens, the comet slips from the constellation of Lepus to the northern edge of the celestial river, Eridanus. A bright moon the first week of January will interfere with observing, but the comet will be moving northward until it reaches the edge of Andromeda by the end of the month. Happy comet hunting. Comet C/2012 S1 (ISON) was sun grazing comet was discovered on September 21, 2012 by Artyom Novichonok and Vitali Nevski, using a 16-inch telescope that is part of the International Scientific Optical Network (ISON). It was nicknamed the Holiday comet because its perihelion date was November 28, Thanksgiving Day in the U.S. Despite high expectations, this comet broke apart due to its close encounter with the Sun. After a long life of 4.5 billion years, ISON was destroyed at perihelion. Discovered by Robert McNaught of the Siding Spring Observatory in Australia on August 7, 2006. Perihelion was January 12, 2007. Peak magnitude estimate -0.6! So long, Comet McNaught, it won't be back to visit the inner solar system again. In 1995, Comet 73P/Schwassmann-Wachmann 3 split into "mini-comets" flying single file through space, much like Shoemaker/Levy9 that crashed into Jupiter. Closest approach to Earth: 5 million miles on May 15, 2006. Well, 1986 was a bit before the age of information, wasn't it?? ?